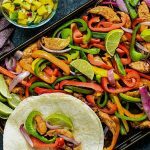 Sheet Pan Chicken Fajitas is an easy sheet pan dinner recipe made with perfectly seasoned chicken, bell peppers, and onions cooked together on one simple sheet pan. In a small bowl combine chili powder, cumin, salt, garlic powder, and onion powder. Place thinly sliced chicken, bell peppers, and onions in a large bowl and sprinkle with the spices tossing until everything is well coated. Spread the chicken and vegetables on a parchment paper lined, or greased, sheet pan. Bake for 15 minutes or until chicken is cooked through. While the fajitas cook warm Mission Organics® Flour Tortillas according to package instructions. When fajitas are ready fill tortillas with chicken and veggies and enjoy!